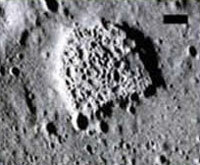 In December NASA announced plans to build an international base on one of the poles of the Moon. The base is to be finished by 2024. Russia’s booster rocket maker, Energia, has a more ambitious program: to build a permanent manned base on the Moon by 2015. Russia says the base will be built to develop the industrial production of helium-3. U.S. specialists prefer not to say anything specific on the matter. To crown it all, China launched its first satellite to the Moon on October 24. China also intends to launch a lunar base and an unmanned space probe to the Moon by 2010. Non-radioactive isotope of helium, helium-3, is a powerful fuel for the nuclear synthesis. Only six tons of this fuel would provide enough energy to power a large European country for one year. The qualities of the gas (pollution-free and very high output) make many countries treat the perspective as seriously as possible. Germany, India and China conduct a number of research works to develop methods of helium-3 extraction. Hoagland and Johnston also intend to prove that NASA virtually acts as another defense department of the United States, entitled to classify important technical and scientific information without the control of the U.S. Congress. Hoagland says that American astronauts could secretly deliver samples of extraterrestrial technologies from the Moon to the Earth. The technologies, the scientist says, push world’s leading countries into a new lunar race. “Unlike the previous space race between the USSR and the USA, the new one will determine the life of every single human being on Earth,” Hoagland said. Hoagland and Johnston think that the USA deliberately intensifies shuttle launches in order to shut down the program ahead of schedule and start using new the spacecraft, Constellation, that will let the USA land on the Moon again. Richard Hoagland says that NASA conceals a number of other secrets, including the discovery of microbes on the surface of Mars. The discovery was supposedly made by unmanned space probe Viking in 1976.